The group of pterygota is again divided into exopterygota and endopterygota. In exopterygota the imago developed directly from the larva, while in the group of endopterygota after the larva or caterpillar there is a resting stage, the pupa. The process of converting from caterpillar to pupa is called metamorphosis. Butterflies (lepitoptera) belong to the group of endopterygota. There are approximately 160,000 known species. 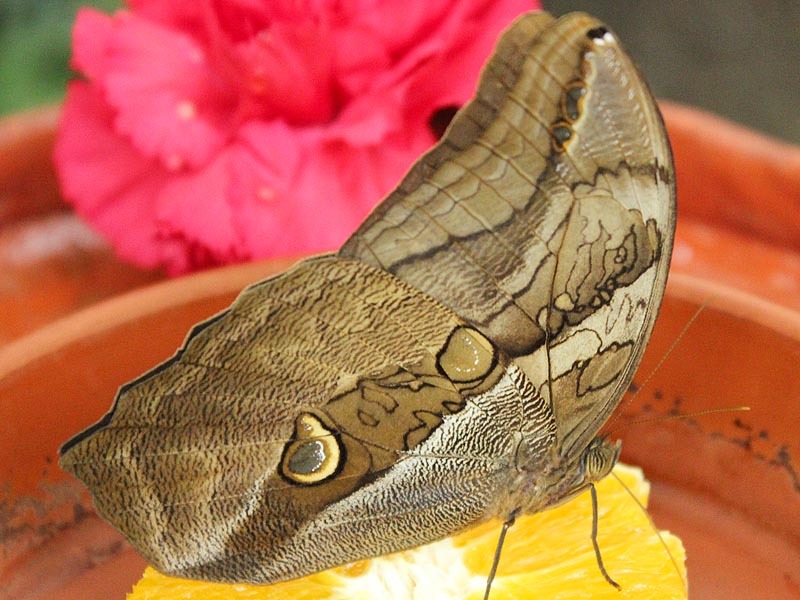 Only 15 percent of species are butterflies (club-shaped antennas). By far the larger group are moths (fan-like antennas). The further subdivision are superfamilies, families and subfamilies. Atlas moths have the largest wing surface of all species of butterflies. The wingspan of a female may be up to 30 cm. The males are generally smaller and only reach wingspans up to 22 cm. Thus, this moth is one of the largest on Earth. There size stands in contrast to the short life expectancy as a moth of only three to five days. As moths they can not feed, and thus their life span is very limited. Within this short time, the moth must have mated. Charactaristic of the males are significantly more pronounced fan-like probes. 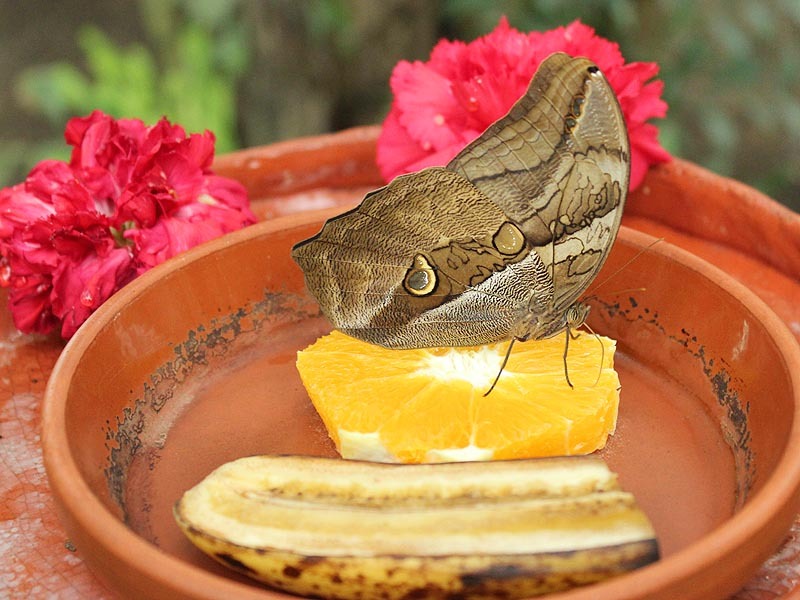 The caterpillar of the atlas moth feeds on a wide variety of plants such as hibiscus, lilac or avocado. It reaches an enormous length of up to 10 cm and the thickness of a thumb. The caterpillar has fleshy thorn-like outgrowths all over the body and is powdered white. During the growth phase it sheds its skin up to five times. After the skinning the caterpillar eats its old skin. 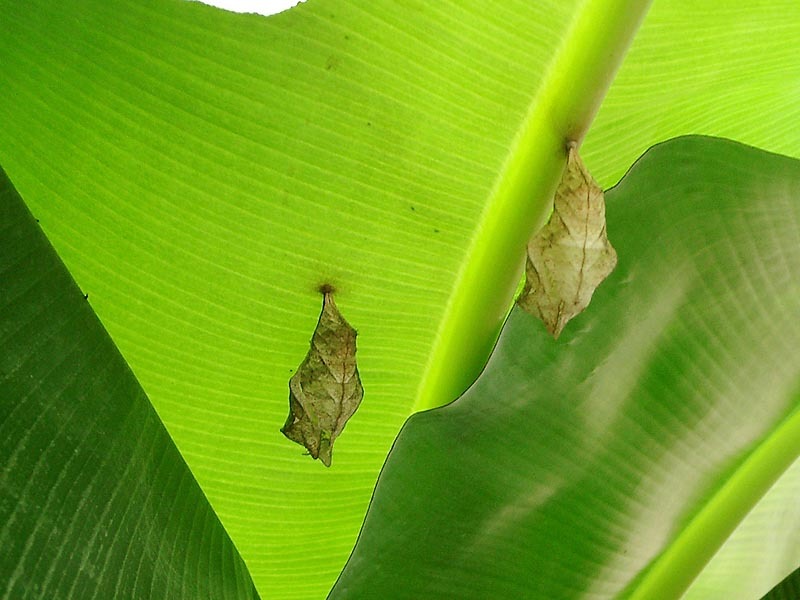 Before pupation the caterpillar spins a cocoon, which is camouflaged in a leaf. The thread length of the silk thread can reach up to 10 km. Fagarasilk can be made from the silk thread of the atlas moth. 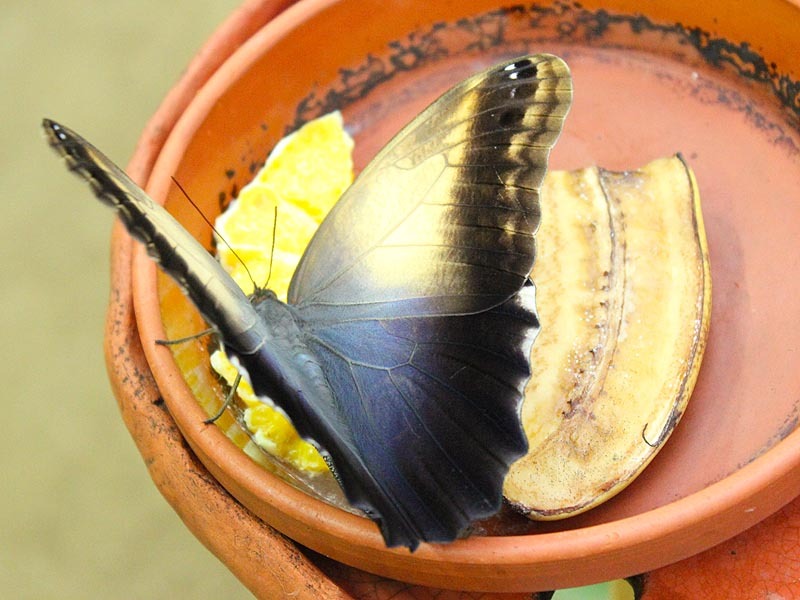 This beautiful butterfly has deep violet iridescent wings with black rims. The females are larger than males, but have only a slight blue tinge instead of glowing purple coloration. A distinctice feature are the large eyespots at the bottom of the hind wings. Their habitat ranges from Guatemala to the Amazon region. In these areas of the rainforrest they may be found up to an altitude of 1200 meters. 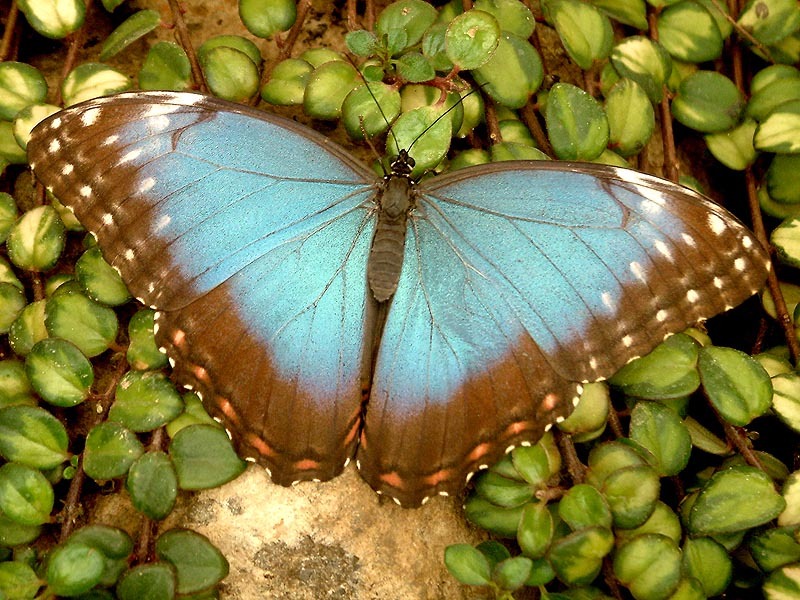 The purple mort bleu butterfly is a so called dawn active butterfly. Larger groups of it cann be seen in clearings at dusk, morning and evening. Their wingspan is about ten to twelve centimeters. 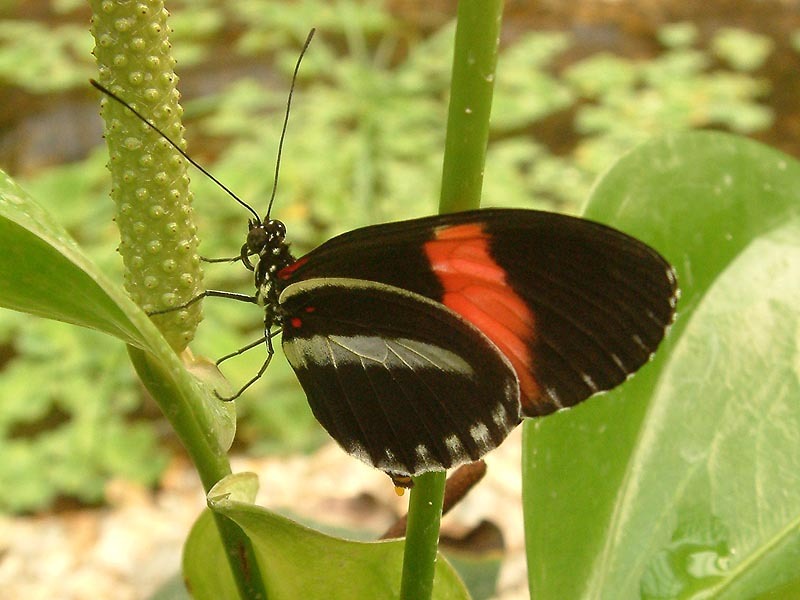 The caterpillar of this butterfly grows relatively slowly and lives at Heliconia a relative of the banana, and marantacea, and cyclanthacea plants. Adult caterpillars are prickly and inedible for birds. The unusually large caterpillars have a hard head capsule. They excrete a substance that deters even army ants. They belong to the family of Brassoliden. They are spread from Mexico to the Amazon region and live in lowland rain forests and rural areas. The eye spots on the bottom of their hind wings, that look like owl eyes, have a forbidding effect on their enemies. They fly mostly at dawn and at dusk. Their main food source is the juice of rotten fruit. 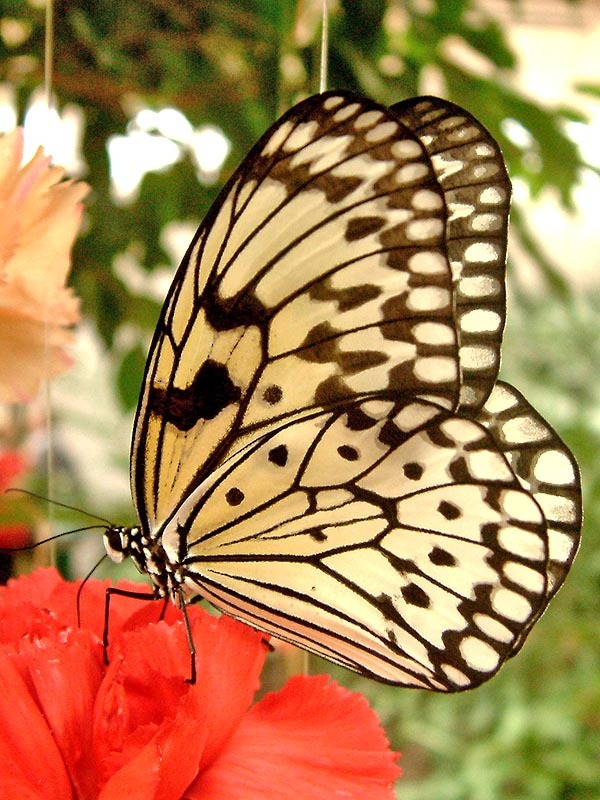 This butterfly was first described in 1775. It has many subspecies, and can be found frequently both in the woods but also in parks and gardens in India and Sri Lanka. Despite belonging to the swallowtails they lack the typical blackened rear wing. The blue mormons wing span is up to 13 cm. While males have a silver-gray drawing on their hind wings, females are often pale and yellowish. They are good flyers and travel long distances. The caterpillars feed on plants of the Rutaceae family. Clippers are found in Southeast Asia – from India to New Guinea. Their color is different in each region. In addition to brown, green and blue, some are also orange. The white patches are transparent , they lack the colored scales. Parthenos sylvia is a forest dweller and flies in the treetops. They often gather in large swarms near riverbanks or sandbars to take in moisture. The caterpillar of this moth is green to yellowish brown with dark purple spines and feeds of, among others, Adenia palmata. 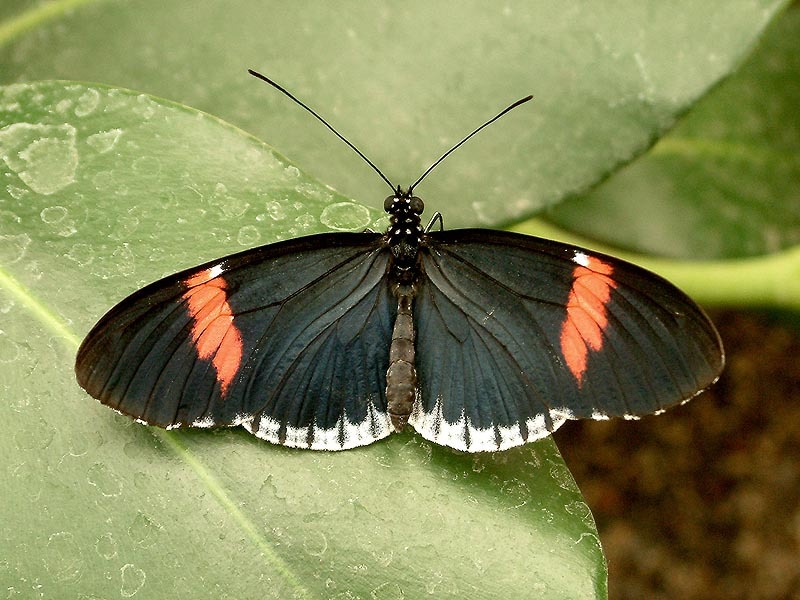 This black orange butterfly is common in the tropical and subtropical regions around the world. It is regarded as the most famous example of butterfly migration. The Monarch migrates from Mexico to Canada and the autumn generation then travels back to hibernate in large groups in Mexican forests. Caterpillars feed on Asclepias. Since these plants contain toxins, which the caterpillar stores under the skin, it and the butterflies are inedible for predators. 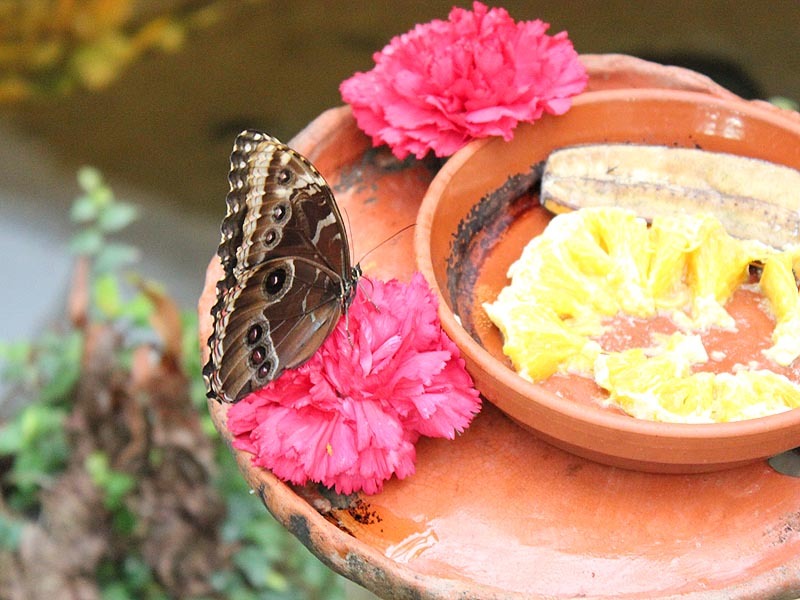 The blossoms contain a lot of nectar and serve the butterflies as rich food source. Before the journey home they put on fat reserves to cope with this huge distance. A common butterfly to the Indoaustralian fauna Region. Its habitat extends from Australia and the entire Indonesian area, up to parts of eastern Africa. It is a good example of the phenomenon called sexual dimorphism. This means that males and females have different wing drawings. The caterpillars are not very picky and feed on plants of the families acanthus, mallow and nettle. The female lays small, pale blue eggs on the food plant. The asian Great Orange Tip is found in the fields of Japan, China to Malaysia. This white butterfly has bright orange wingtips. The white areas of the front and rear wings of the females are framed more or less black. The females prefer wooded terrain. This butterfly procreates twice per year in its natural habitat. The generation in the rainy season is more numerous than that in the dry season. The host plants of the caterpillars are different kinds of capparis. It lives in South and Central America, and in the south of the USA. It prefers no specific landscape type, but lives in meadows and tropical rain forests. They feed on pollen, from which they obtain amino acids, of which they can live for up to 9 months. The eggs of this species are laid on passion flowers. The caterpillar lives on at least 4 different Passion flowers. As a butterfly it is a apt flyer and covers long distances. 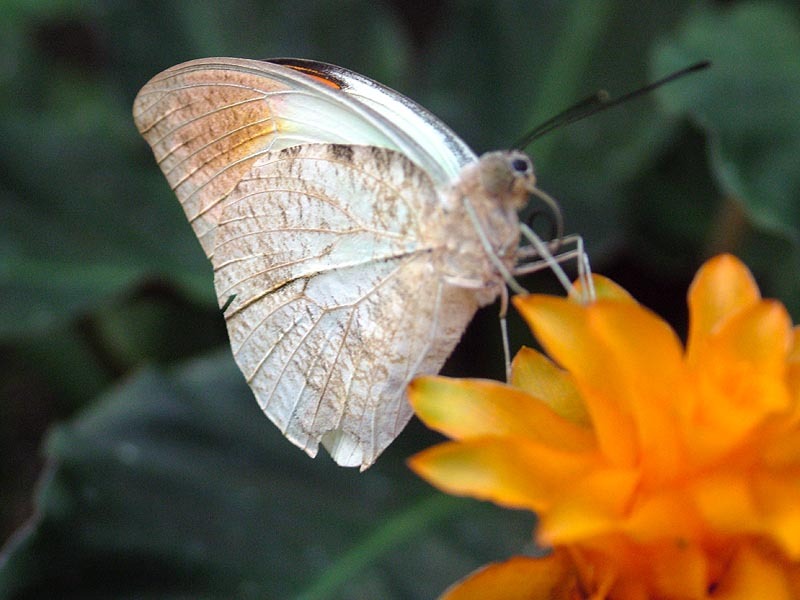 This butterfly is at home in Central America, Colombia and Venezuela. Particularly notable are the strikingly blue insides of its wings. They earned him the German name ‘Himmelsfalter’ (Sky butterfly). In the resting stage and when feeding these butterflies sit with their wings folded. On the outside of the wings you can see a row of brown eyespots. They serve to deter its enemies but also for camouflage. 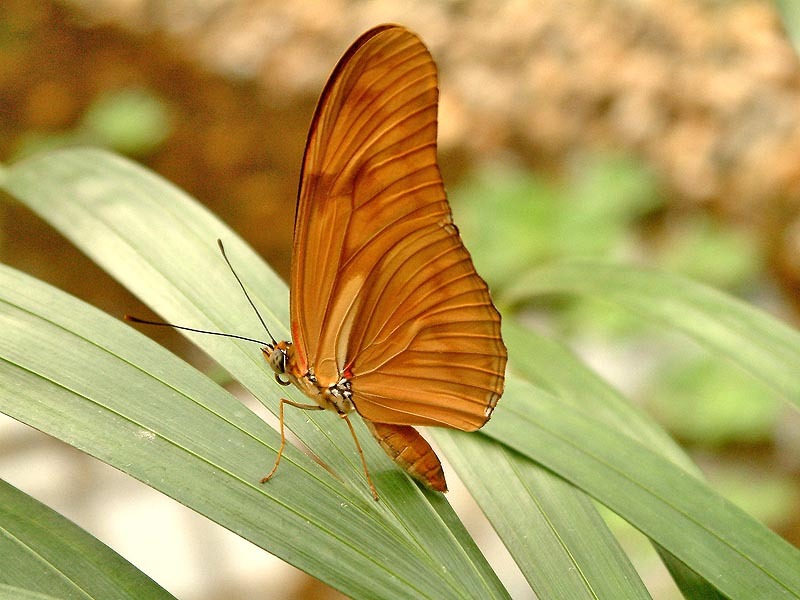 The butterflys show the iridescent insides of the wings only if they are in mating season and want to attract partners. The caterpillar feeds on the leaves of Calliandra grandiflora. Occurres in India, Pakistan, Burma, China and Taiwan. They live in the rain forest in sunny areas near riverbanks. The wing undersides bear a striking resemblance to dry leafes including the midrib. 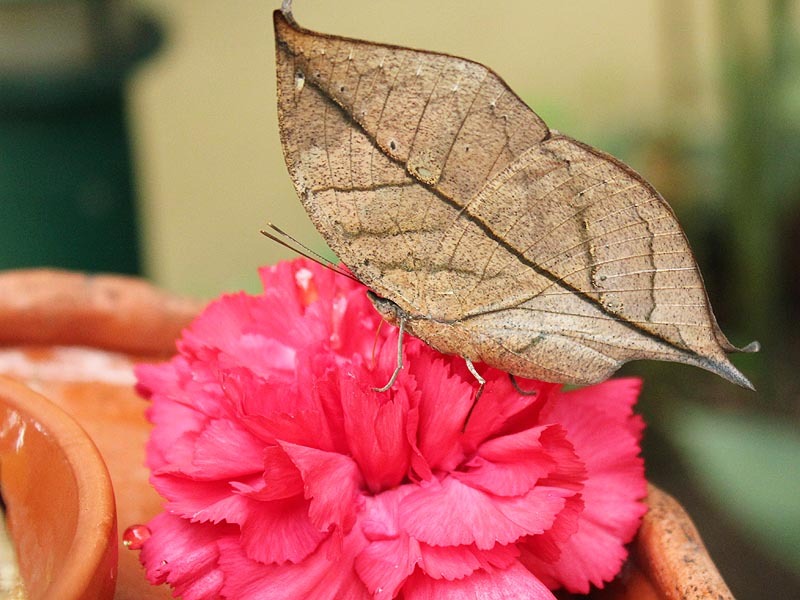 For this reason, the Kallima species are also referred to as leaf butterflies. The camouflage is almost perfect. 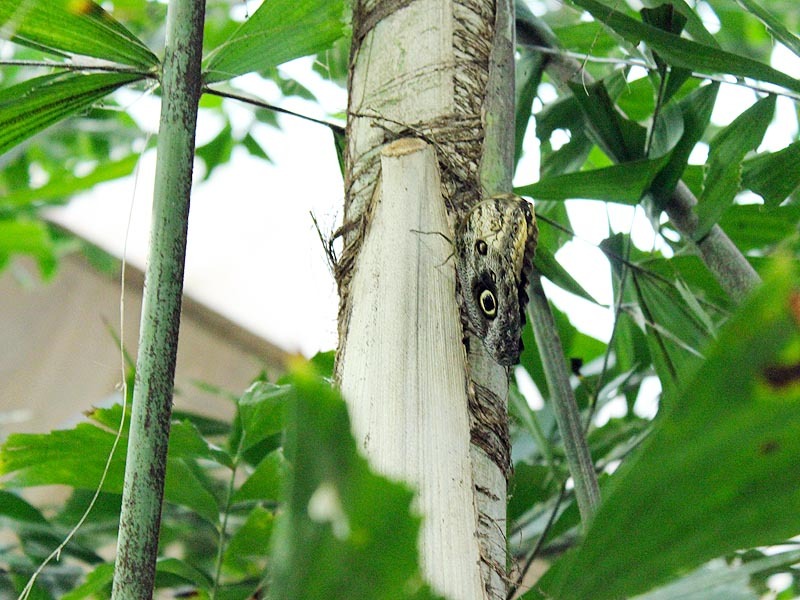 Especially on deciduous trees this butterfly can hardly be spotted. The camouflage is an important protection from its predators. 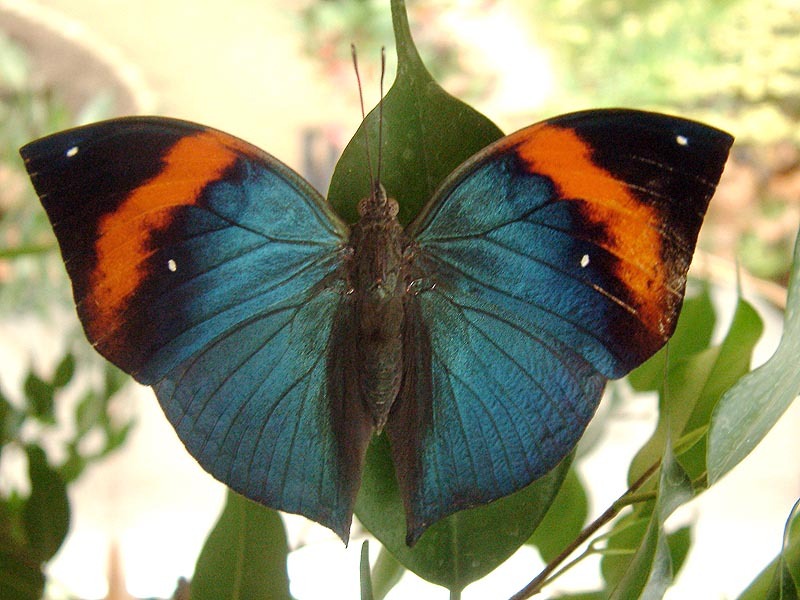 The inside of the wing is often iridescent blue with an orange band. 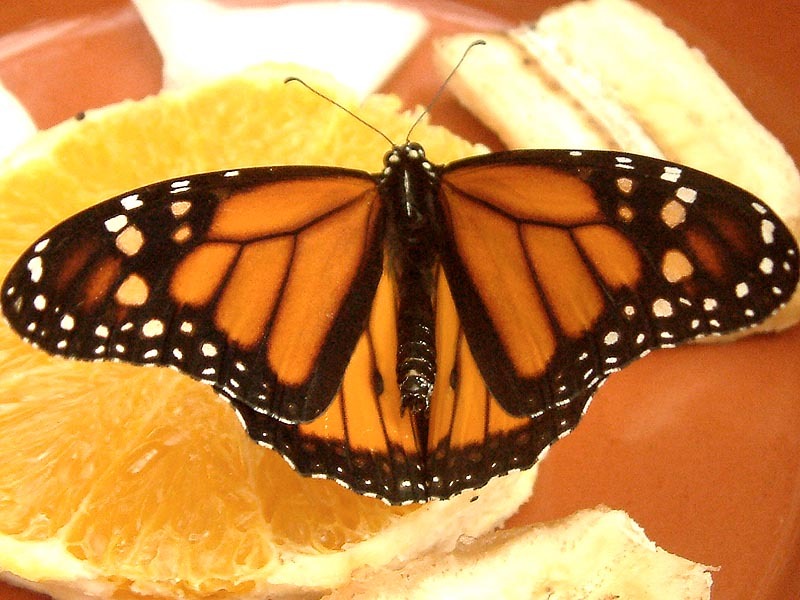 These butterflies feed primarily on the juices of rotting fruit. This moth is orange like a candle flame, so it is also called ” The Flame “. It’s habitation area is South and Central America to Texas and Florida. It prefers to live in the tropical forest, but is also commonly found in the gardens of these regions. It very much likes the nectar of the Lantana tree. The female lays the eggs upright and separately on different Passion plants. The prickly caterpillars are up to four centimeters long. The puppet has two shiny metallic spots, which shine in the sunlight. The Helconius Erato is mainly common in North and South America and feeds on the sap of rotting fruit. 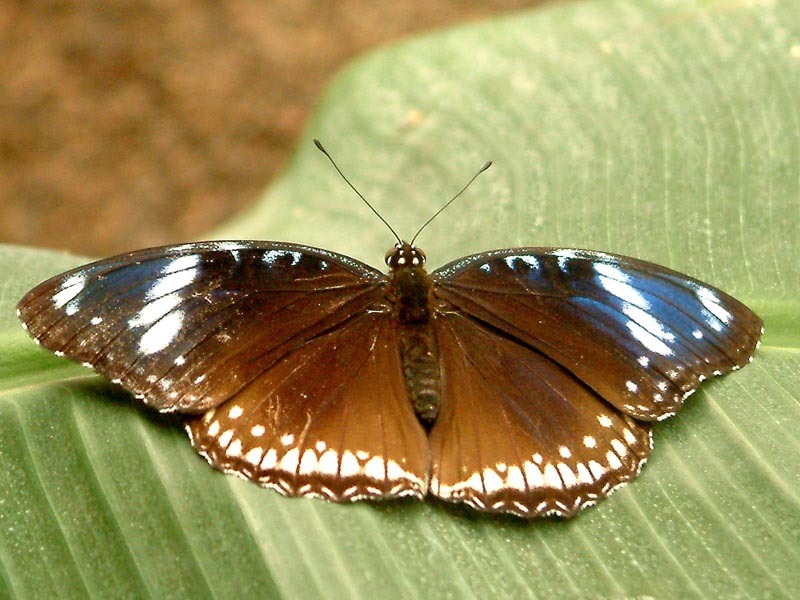 This butterfly has very many subspecies and color variations. This is why this butterfly is interesting for many collectors. So collectors usually have several showcases documenting the variety of colors of this butterfly. Because of this splendor of color shades one can distinguish individual species only by the different cocoons. The pupa of Heliconius Erato have two ” horns “. The caterpillar eats various passiflora. It is widespread throughout East Asia from Japan over Korea, Burma, and Thailand to Australia. Its habitat stretches from the plains to the areas of the tropical rain forest. As food they prefer the nectar from flowering plants like lantana. But they also feed on the moisture in manure and drink dirty water for the minerals contained in it. 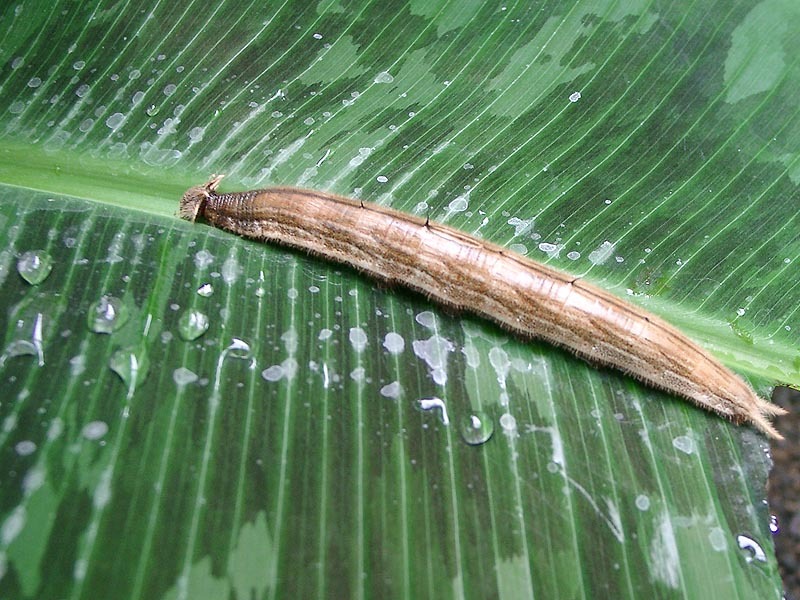 Its caterpillar eats preferably at cinnamon trees, but is not picky when choosing the feed plant. The females lay their eggs on plants of five families, including myrtaceae and lauracea. 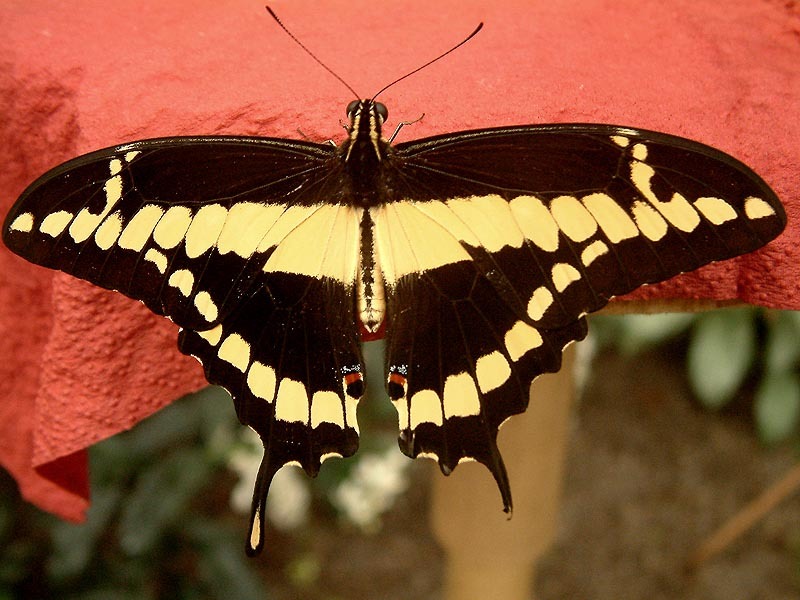 This exotic swallowtail has a vast distribution area, which extends over the entire South American continent from Mexico to the southernmost tip of South America. It therefore belongs to the Neotropical fauna Region. With a wingspan of 12 to 14 cm it is one of the largest exotic dovetails. Both sexes have identical narrow wing shapes and colors. The body is yellow with a brown base color. The yellow color is caused by pigment components in the scales of the wings that fade with age. 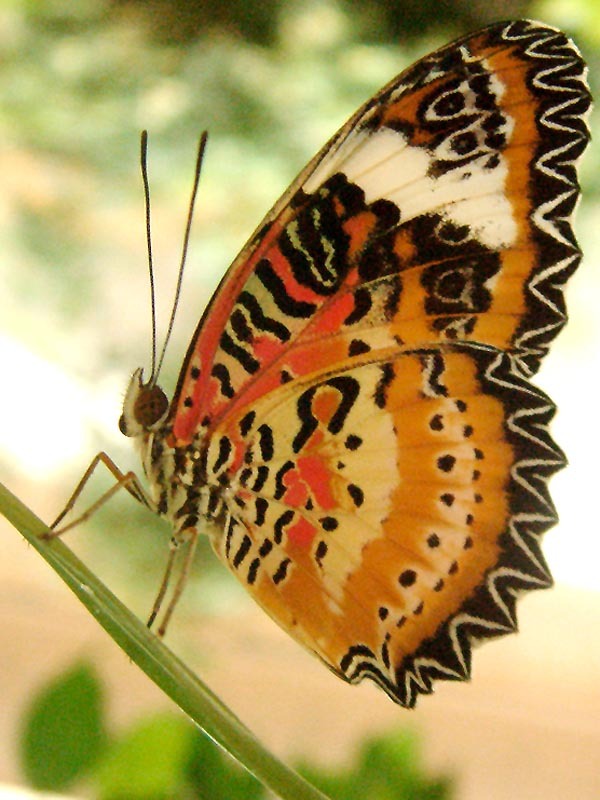 The Leopard Lacewings comes from the Indo-Australian region. It’s homeland extends from southern China to Australia, including the archipelagos of Indonesia and New Zealand. The wingspan is five to seven centimeters. The butterflies are colored flashy witch is a warning that the moths are inedible for their predators. Their upper wing surface is bright red to red-brown and has a white band on the forewings. Females are usually somewhat paler in their coloring. The bottom is much more impressive than the top. 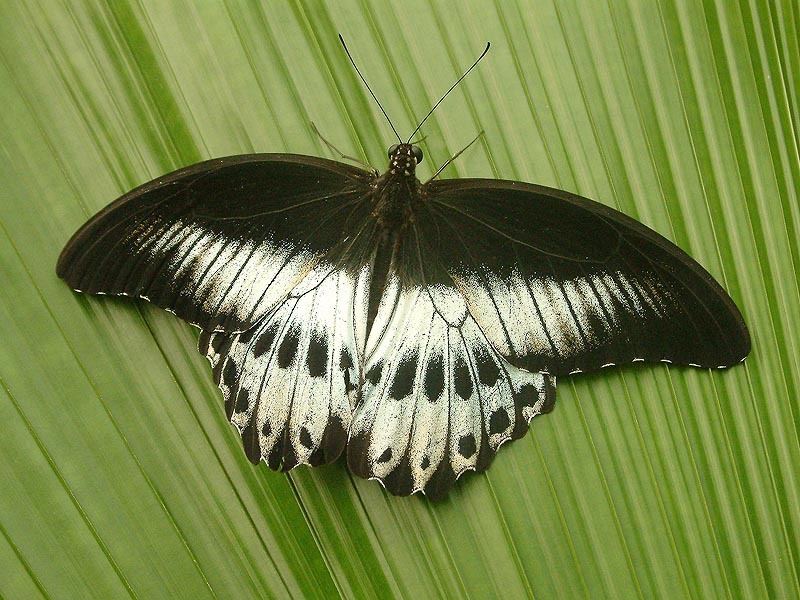 The home of Papilio demoleus extends from the Philippines to China, from Burma to Afghanistan, and Australia. The wingspan is about 8 to 9 cm. The basic color is black and its wings are covered with yellow spots. Papilio demoleus belongs to the family of Papilionidae. Its caterpillars can cause severe damage in citrus orchards. Man-made mono cultures are ideal feeding grounds for these caterpillars. It is a very good flyer and covers considerable distances. This butterfly is spread throughout the Americas. It belongs to the family of Papilionidae (swallowtails). Its diet is the nectar of various flowers and the juice of fresh manure. 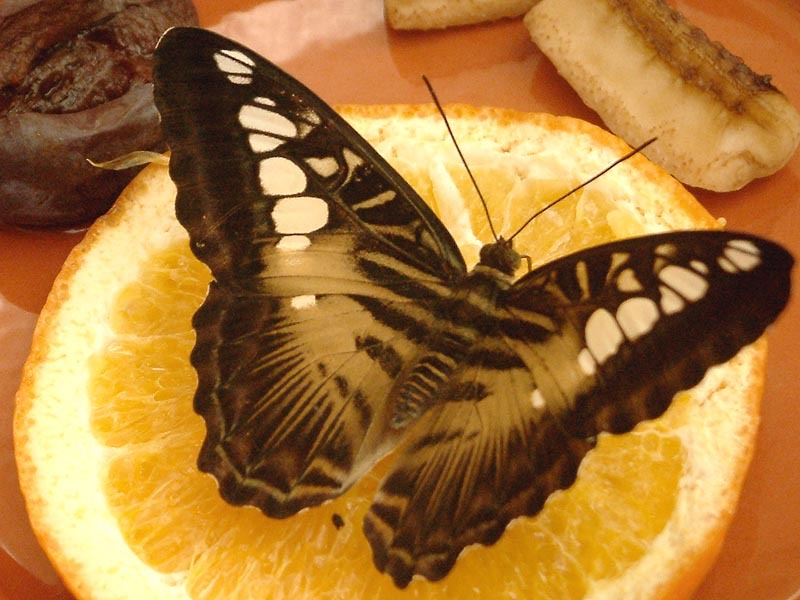 The caterpillar of Papilio cresphontes feeds on citrus. This dovetail is at home in Malaysia, Indonesia, and Burma. It lives in mountainous areas of the islands. 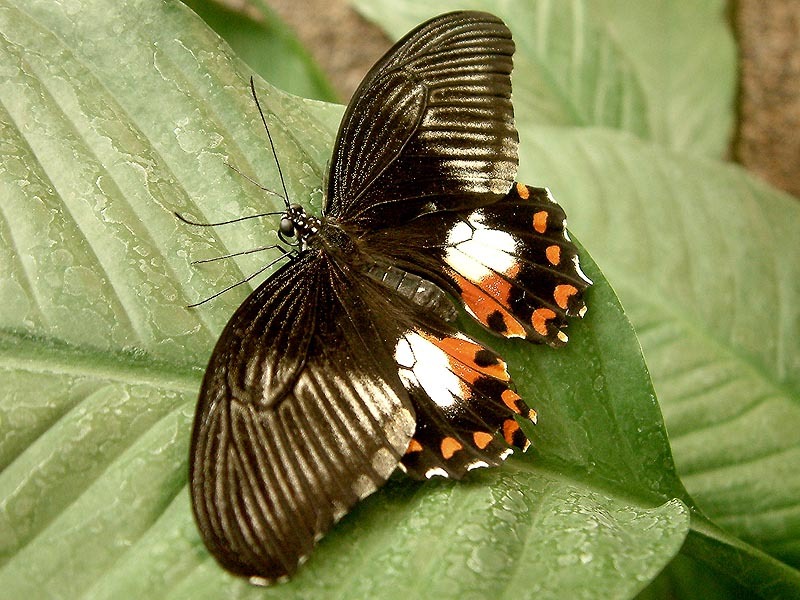 This butterfly can reach wingspans of up to 10 cm. Colored black and green, it fits excellently to the area. When the sun is bright even the bright green is a good camouflage in their environment. It should not really look green because it has no green pigments. However, the wing scales have tiny pits where the bottom is yellow and the side walls are colored blue. Our eyes can not separate the two colors and see them as green. It’s a big flashy butterfly from the Indo-Asian region. The two sexes differ in color. The females occur in many different color variations, while the males only have one color. Their black and red colors are warning colors to protect against insect eaters. The eggs of Papilio rumanzoivia are yellow and round. 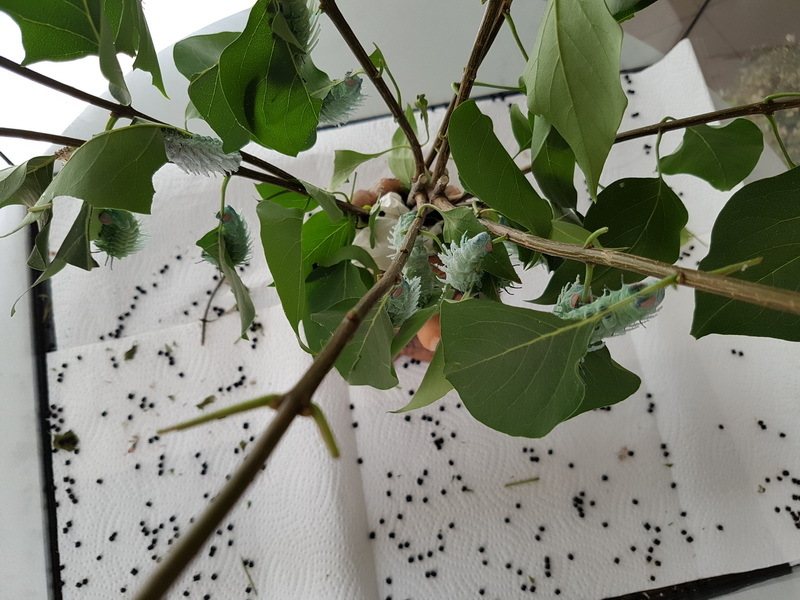 The female lays them individually on the respective fodder plants the caterpillars and pupae adapt to their surroundings to camouflage from predators. They are up to 4 cm long green like a leaf or brown like a branch. The species is broadly distributed throughout Africa and Madagascar. 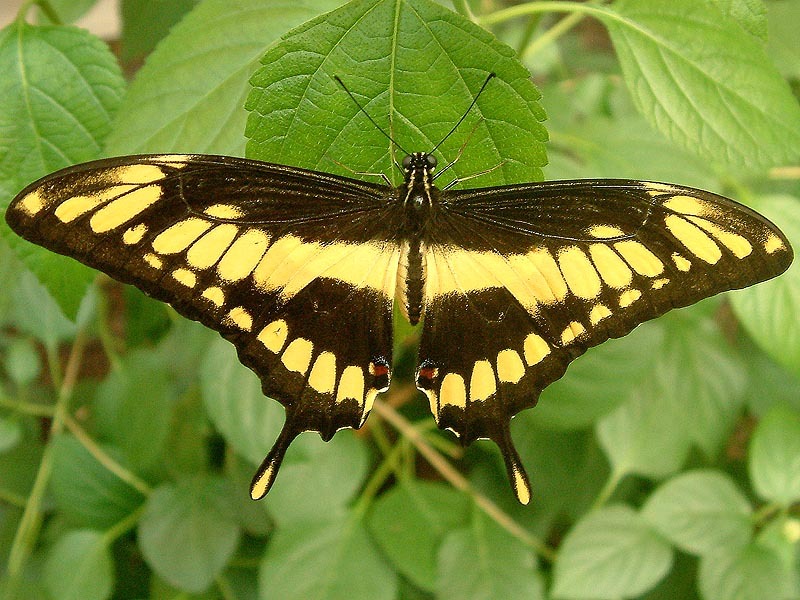 Males have bright yellow, black-framed wings. The “dovetails” are pronounced. Males all look the same throughout the entire habitat. The females, as seen in the picture, are black with large white spots. They imitates various poisonous butterflies in no less than 100 different forms. 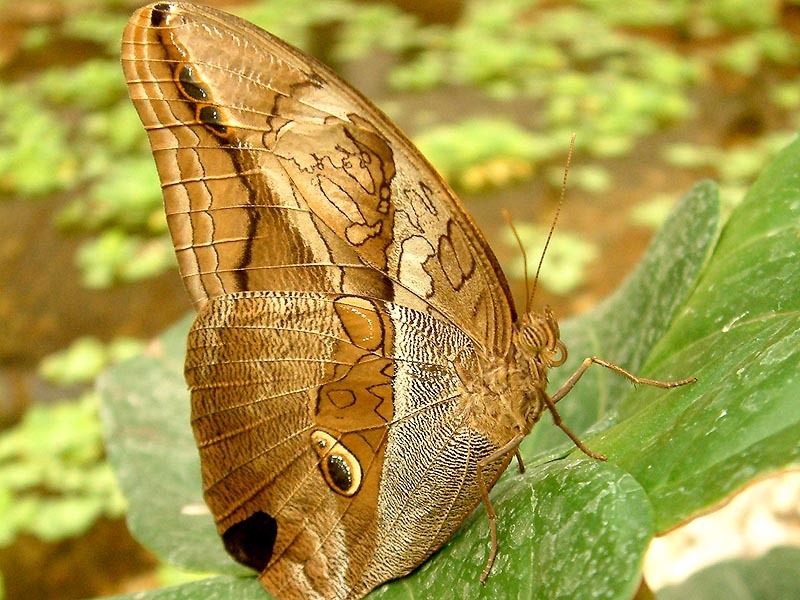 This butterfly is a prime example of “mimicry” i.e. the imitation of other species. The host plants of the caterpillars are Clausena and Citrus plants. Greta oto is distributed from Panama to Mexico. 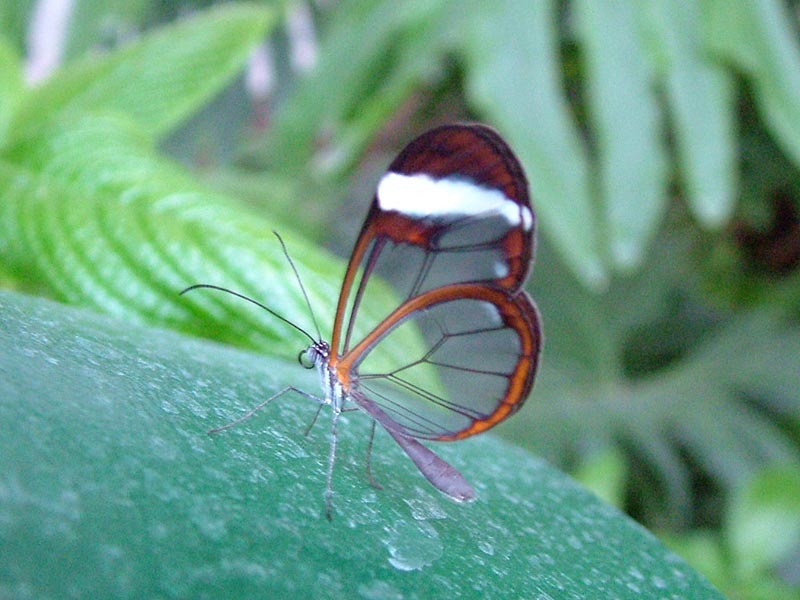 It is very difficult to observe because its wings are transparent. Only the wing tips are white. As a result they look especially fascinating when in flight. Greta oto are very active fliers and covers up to 15 kilometers per day. They feed mainly on the sap of rotting fruit and manure. The females lay tiny eggs singly on the host plant. The bright green caterpillar is spineless and feeds on different species of Cestrum. The large tree nymph is widespread in South East Asia i.e. China, Malaysia and some Indonesian islands. 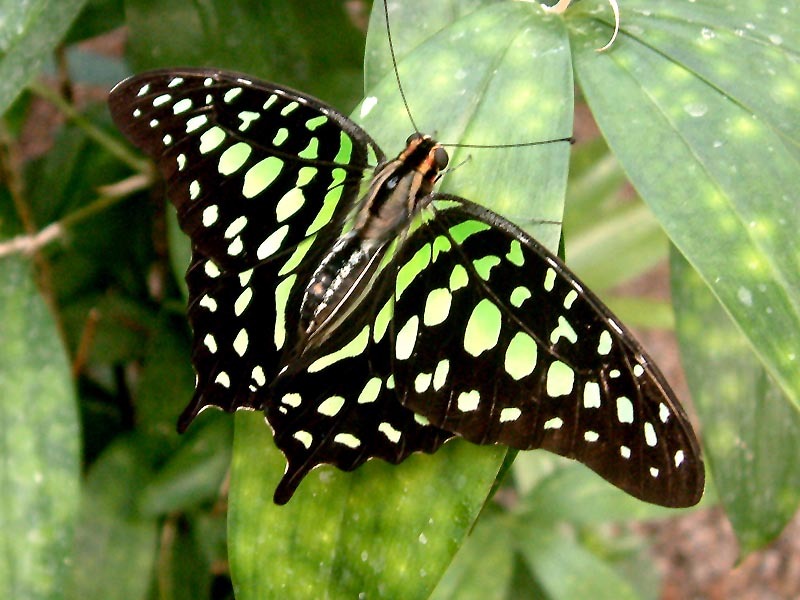 The butterfly lives in dense rain forests. The host plant of the caterpillar is Tylophora. It is a medicinal plant from India. The active substance alkaloid causes, among other things, vomiting. The caterpillar stores this poison under it’s skin as a protection against being eaten. When the caterpillar morphes this trait is passed on to the butterfly. Idea leuconoe is not a good flyer, but it uses an energy-saving type of gliding. This butterfly’s distribution area stretches from the Everglades of Florida to Central America and the north of South America. 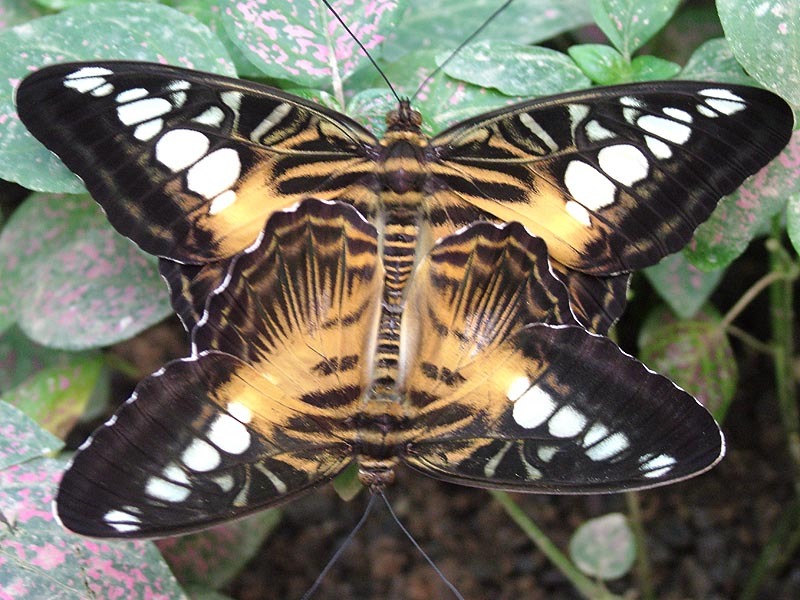 It’s common name comes from the striped pattern of the butterfly’s wings. 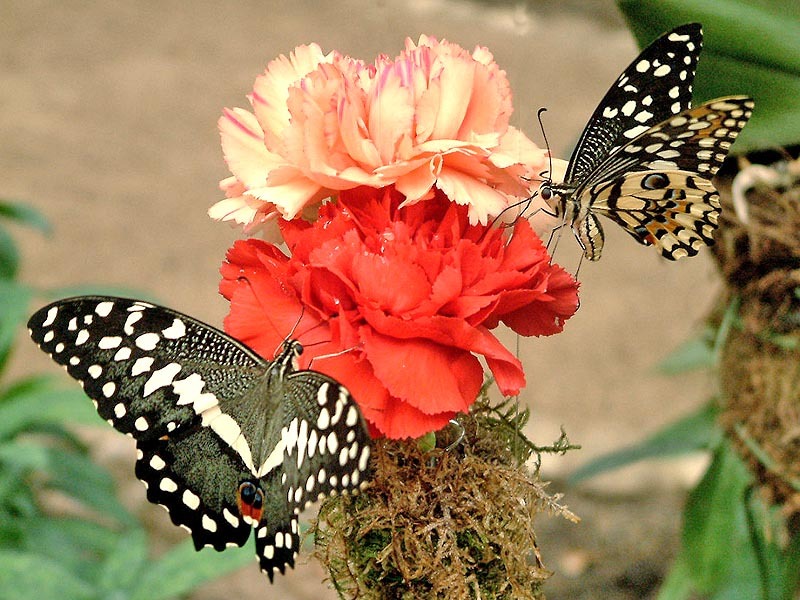 The butterflies feed on nectar from flowers. When feeding they unconsciously collect some pollen, that sticks to the proboscis. They are dissolved several times a day by an enzyme and absorbed. Through this additional food life expectancy is extended by a few weeks.